Children at Harting School chose to support two charities this year - The Gauchers Association and Pets As Therapy. One of the past pupils had Gaucher disease hence the suggestion, which came from the children. 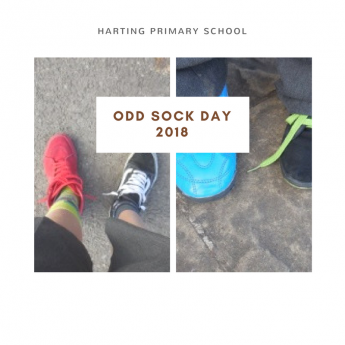 Their first fundraising idea was to wear odd socks which has raised £94. They have some other events 'up their sleeves' and are keen to run a sponsored silence next term - clearly something the teachers would enjoy too! 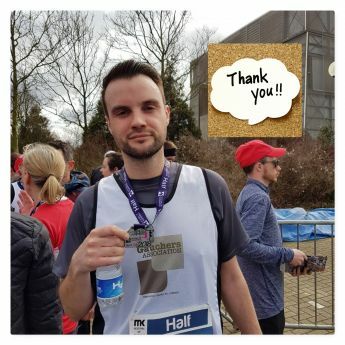 Congratulations and thank you to Glen Moran who completed the Milton Keynes half marathon in March in memory of his daughter Emily. Glen has raised over £845 for the Association and neuronopathic research. Lucy says 'Running a marathon was as far from my goals as you could get when I started running 4 years ago, especially when I ran my first half marathon in Bristol in 2014 and thought there was no way I would ever be able to run the same distance again straight after. But it is funny how things turn out, when I was a child I remember watching the kids running the mini marathon and thinking it would be good fun and then last year I was watching the Heads Together program on the BBC and seeing how truly inspirational they all were that I started to think, maybe... and so after a little encouragement from family, friends and fellow runners I decided to enter, what is the worst that could happen. Jump forward a year and I can now say I am a marathon runner! It is one of the most exhausting, exhilarating and fantastic things I have ever done and an experience that I will never forget. It was a very hot day, but the crowds and supporters were brilliant, there wasn't a space on the route empty, the London Marathon is truly an awesome event. I am extremely grateful to Dursley Running Club and to the Gauchers Association for giving me this opportunity and I am honoured to be able to help this worthy cause'. 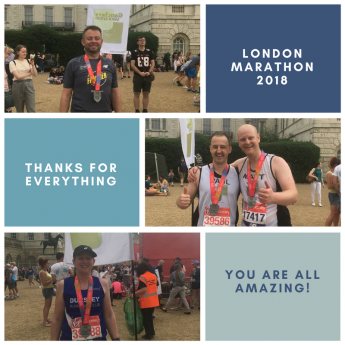 Matt writes 'Running in the London Marathon has always been on my bucket list and this year that dream came true !! Training had gone pretty well during the winter months apart from the usual niggles when running long distances. Then the week leading up to and during the weekend, nature decided to play cruel trick on all the us London Marathon runners who hadn't trained in more than ten degrees by bringing us temperatures of mid twenties, thanks for that! 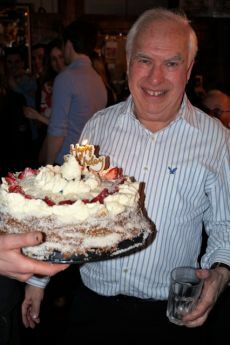 David Lew celebrated his 70th birthday on 15 April 2018 and asked that guests make donations to the Gauchers Association instead of bringing gifts. Happy birthday and many thanks!